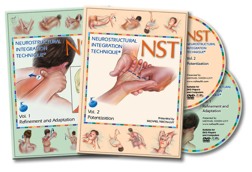 The NST DVD Training Systems are available for both the complete Osteospinal OS seminar and OS Advanced seminar and provide an excellent alternative and extremely simple method to learn NST. 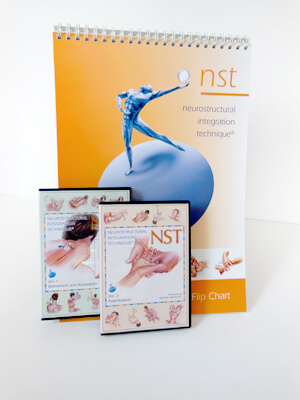 The Osteospinal OS seminar is a Double Disc presentation know as the BASIC DVD Training System. The Discs are titled Core and Categories respectively. The OS Advanced seminar is also a Double Disc presentation known as the ADVANCED DVD Training. The Discs are titled Refinement – Adaptation and Potentisation respectively. Produced in High Definition both NST DVD Training Systems encapsulate the seminars in their entirety. Every procedure demonstrated is accompanied by practical on-screen notes and integrated numbering systems along with full colour NST anatomical images of every point demonstrated. The complete system is further supported by A3 sized full colour flip charts that are fully integrated with the DVD Training Systems. The menu choices provide simple and instant access to any NST procedure. For attendees of the live seminars the DVD Training Systems are the perfect learning tool enabling participants the unique opportunity of taking the seminar into their homes and offices.